Below is a screencap (TextWrangler > View Invisibles) showing four spaces after the INFO header, followed by a tab. Manually deleting these spaces results in a different error when trying to reload the file into IGV. Here's a screen cap showing the header with the spaces removed and the subsequent error message that IGV kicks out when trying to load the file. Looks like the blank line after the "#CHROM" line is the problem. Try deleting that line. Thanks for looking into this. 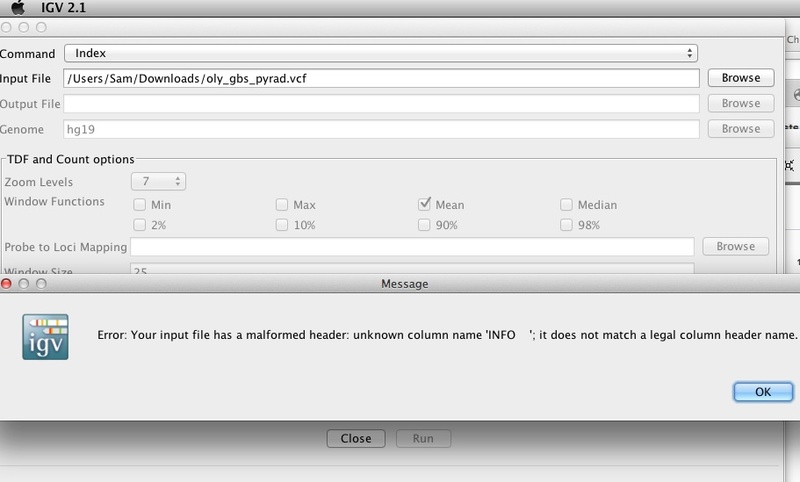 I haven't used IGV before, so I'm not sure exactly the requirements it has for the VCF file. The pyrad VCF for denovo data is a little different from a standard VCF since there isn't a real reference, but rather just a pseudo-reference that we make up from the most common base at each site. I made the format option in pyrad because it was requested but I have not tested it rigorously, so I'm not surprised the format might be incompatible with some software. I'm interested in fixing whatever the problem is though. I've already made some changes to the VCF format in our new software ipyrad, which I encourage you guys to check out (http://ipyrad.readthedocs.io). We now store read depth information in the VCF, so it's a lot more data rich. Looks like we've removed the blank line after the headers too, which might fix the problem. I'll try to check out IGV when I get a chance. @atcg - Thanks for pointing out that extra line after the #CHROME line! I must've accidentally added that there (a recent PyRad run did NOT have that extra line). When I remove that empty line AND the extra four spaces after the #INFO column name, there are no issues with IGV. @dereneaton - Thanks for your work on this and for the heads up on ipyrad; will check it out!